You’re sprawled out on the living room floor, a mess of puzzle pieces laid out before you. You try to move one piece into the gap on the bottom right. You think you may have found it, but your heart drops a little when you discover the piece doesn’t line up… it’s not a match. With hundreds of pieces, you know there is only one configuration will complete picture found on the box top. This is what it’s like to create a shooting schedule for a film. It requires the ordering of many pieces in a sequence that strikes the perfect balance of efficiency, convenience, and practicality. A “Stripboard” is a document that contains a row (i.e. “strip”) for each scene in the schedule. These strips are listed in shooting order and day-break rows are placed in between groups of scenes to show where each day ends and the next begins. Other notes such as company moves or unit splits are often denoted as well. The end result is a document that looks like a stack of strips flowing down the page. The stripboard communicates the needed schedule information so effectively that it has become the standard scheduling document that is handed out to any cast and crew that need to know the entire shoot schedule. It is also the basis for other schedule-related documents such as the Day out of Days and Call Sheet. What information should I put in each scene strip? “Company move” is the term for a location change that requires everyone to pack up and “move” to a new location. Basically anytime you will be loading everything into vehicles and driving somewhere else, this should be considered a company move. Make sure to add a strip in your stripboard for these moves. It’s often helpful to include the address of the location you’re moving to, along with an estimate of how long it will take to drive there. At the end of every day’s list of scenes, the stripboard contains a darker row that indicates the end of the day. This should say something like “End of Day 2” and should also list the total page count for the day. Stripboards typically don’t list times for shooting each scene, however, sometimes they will include estimated call / wrap times for each day. Some people also like to include meal breaks in the stripboard, along with the time and location the meals will be served at. When it comes down to it, whether or not to include times is up to you and what will be most useful for your project. Personally, I like to at least include an estimated call time so that people can get a rough idea of when they might be needed; this helps everyone plan ahead. The responsibility of creating the shooting schedule is that of the 1st Assistant Director. (or 1st AD). Sometimes, this person will involve the help of their 2nd AD who is their right-hand person when it comes to office paperwork. 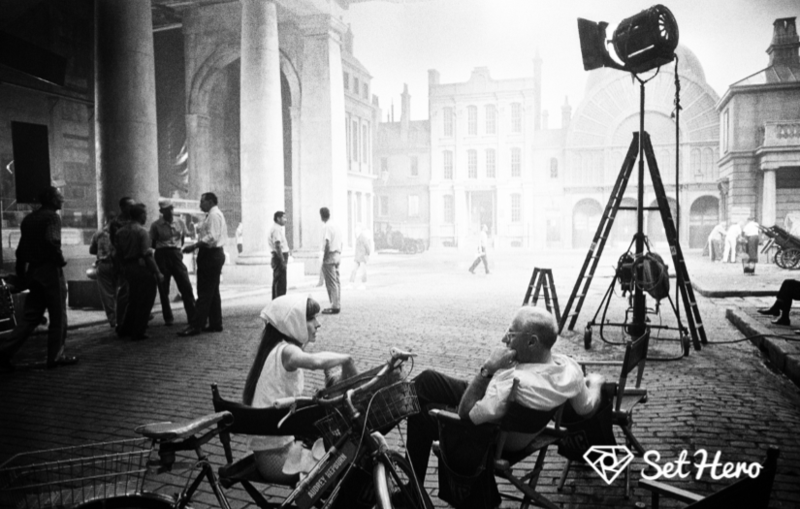 Since making the decisions about shooting schedules affects a lot of departments, there is sometimes also involvement from directors, producers, directors of photography, production managers and location managers. – For software that can help you create a stripboard, check out Movie Magic, Scenechronize or Lightspeed EPS. This professional and beautiful stripboard template is designed to work seamlessly in Excel and Google Drive. 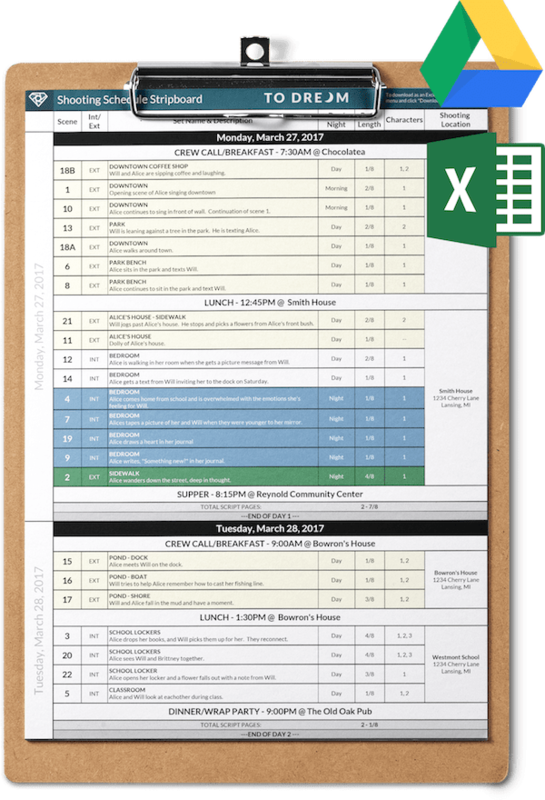 After you’ve built your stripboard, you’ll also want to look at making a Day Out Of Days report which is another really useful document for planning and scheduling logistics. Check out this article for everything you need to know about Day Out Of Days reports. Once you get closer to shooting, you’ll also need to begin creating call sheets for each shooting day. Here’s a helpful guide on how to create a great call sheet.